The Model 5-500 Heated FID Analyzer is the fully heated version of our 5-100 analyzer for pressurized samples measures low trace total hydrocarbon concentration in CO2, Argon, Helium, Nitrogen N2O and many other technical gases as well as from emissions sources. The 5-500. For fastest response and highest accuracy all components in contact with sample are housed in a 190 deg Celsius heated oven, except the pressure regulator. The Model 5-500 is ideally suited for the integration in low concentration semiconductor gases online inspection systems. 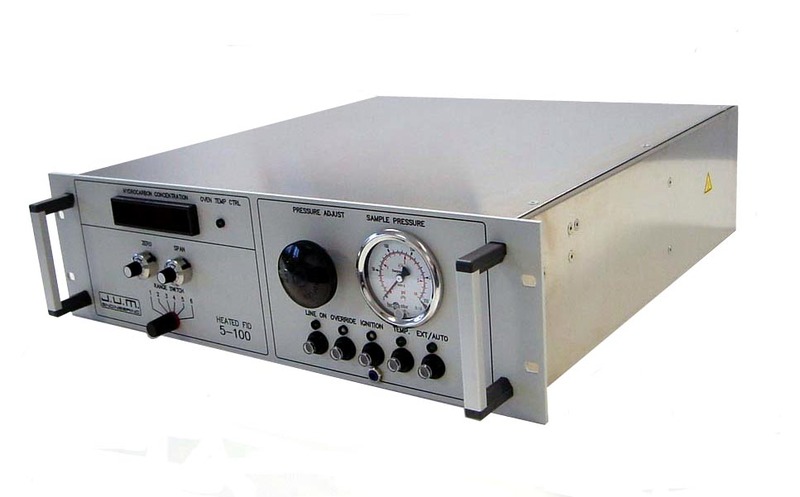 The 5-500 uses a hydrogen flame ionization detector (FID) in a heated oven to prevent the loss of high molecular weight hydrocarbons and to provide long term stability and reliable performance in the analysis of low trace concentration levels of hydrocarbon contaminants in high purity Hydrogen. Sample back pressure regulator (BPR) is housed inside of the heated chamber which allows the analyzer to be used for stack and other emissions applications.